Use anywhere you need a high power quick disconnect. Different colored shells are only compatible with the same color. 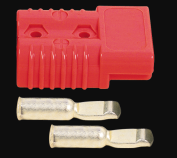 Example: the yellow connector is designed to only mate with another yellow connector. Compatible with common winch makers quick disconnects when you buy the same color. Great for electric vehicle battery chargers, power converter disconnects or tow truck jumper cables. Note: price is for 1 connector only, not a pair. Order 2 if you need both sides. Note: May be made by a different manufacturer than Anderson.